We’ve all heard we should have a baby nighttime routine, but how exactly do you start? When and what age is it appropriate to follow a routine, and how long should each one be? With so much to take in as a parent, it’s no wonder we’re not even sure we’re doing things right, including establishing a routine. When I took my eldest home from the hospital, I felt like I was always scrambling from one activity to the next. Other times, I was so afraid to be home with him alone, doubtful I’d know what to do on my own. And the nights were the worst, waking up multiple times, delirious and disoriented. I knew I needed a routine, fast. I then developed and began to rely on nighttime routines to help my baby—and me—get ready for sleep. When the twins arrived a few years later, I was on new territory once again, this time juggling a baby nighttime routine for two. But I did, and those routines helped smooth my evenings more than if I didn’t have them in place. You’re able to incorporate changes: Consistency allows you to incorporate changes into your baby’s life much easier. Adjusting to a new caregiver or going on vacation won’t seem as jarring when your baby maintains the same routine he’s grown used to. Routines signal the time to sleep: A baby nighttime routine gives your little one the predictability he needs to know what will happen next. Babies don’t understand words yet, but they can comprehend signals. Doing the same things in the same order signals that it’s time for bed. Your baby will feel relaxed and more likely to sleep: Like you and me, babies benefit from a nightly ritual to relax their minds and bodies. It’s too difficult to fall asleep when we’re wired and awake. A baby nighttime routine transitions your little one from awake time to sleep. It’s one less thing for you to think about: Imagine coming up with solutions on the fly every night! A baby nighttime routine not only benefits your little one, it also frees you from always having to think of “what’s next.” With its consistency, routines allow you to run on autopilot and relieve you from having too much to think about. Now that you know how beneficial nighttime routines can be for your baby, let’s dive into how to establish one. We’ll talk about the ideal time to start—both in age and time of the night—as well as activities to do during your routine. What age should you start a baby nighttime routine? Establish a routine from day one. 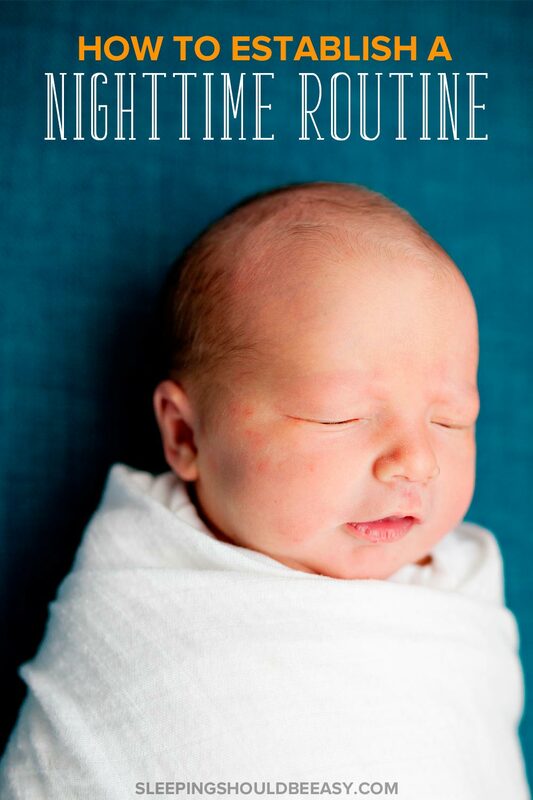 Yup, even as a newborn, you and your baby will benefit from creating a rhythm to your evenings. What this doesn’t mean though is being strict with your routine. All children grow and change. As consistent as we should be with our routines, we also have to accommodate off days and developmental milestones. Your baby will grow out of old routines and into new ones, too. A three-year-old will still benefit from routines, but not the ones he had as an infant. Starting from day one will give your baby the reassuring comfort of routines. He’ll know what to expect and when, and routines will give you a framework of structuring your evenings. Read more about infant development milestones to look out for. What time in the evenings should you start your routine? Bedtime will vary for each child. One baby might begin his long nighttime stretch of sleep at 8pm, while another starts at 6:30pm. What you should note though is when your baby can typically sleep for his first long stretch of the night. Then, add about half an hour to an hour before that time to start your routine. Let’s say your baby’s bedtime is 7pm—start your routine around 6pm or 6:30pm. By the time you’re finished with your routine, it’s time to lay him down for sleep. How long the routine lasts depends on many factors, such as how long he feeds or the activities you have planned. 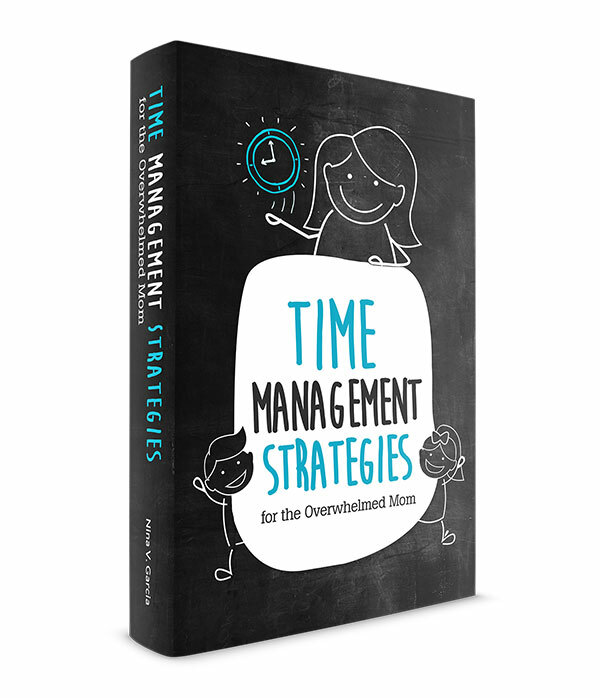 But typically, you’ll want to keep it to about half an hour and no longer than an hour to be effective and doable. You also want to include enough awake time between his last nap and bedtime. It might be tough to put him to sleep when he had woken up from a nap, routine or not. Did you know that your baby’s awake time affects how well he sleeps? 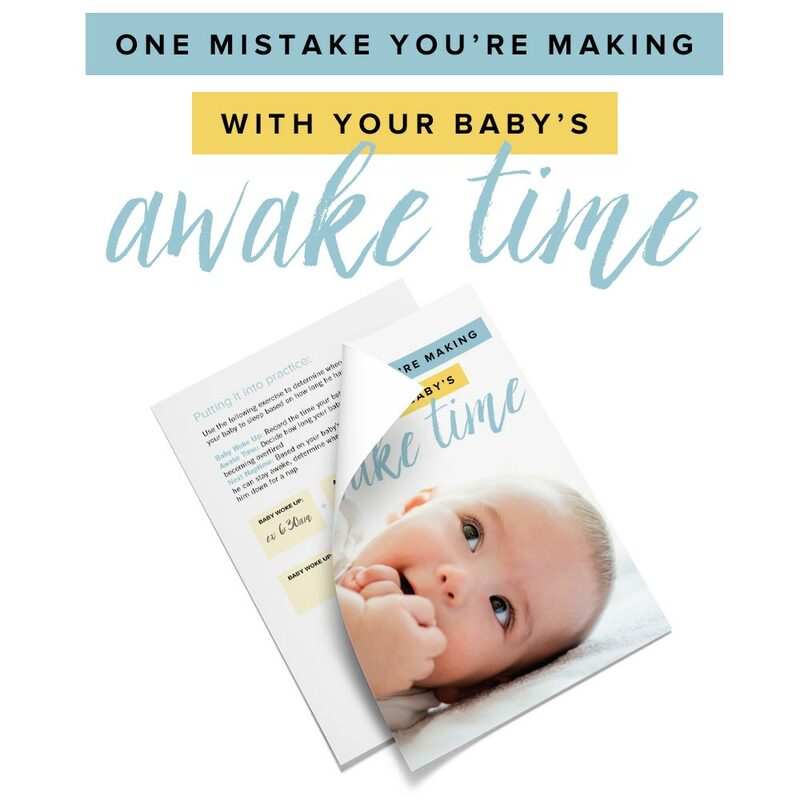 Get my handout and discover one mistake you may be making with your baby’s awake time. Bath: I bathed my babies every night because it was the one activity that was different from anything else we did during the day. Bath time can signal that this is the time to sleep for the night, rather than for a nap. Baths also feel refreshing and allow you to undress and clean your baby completely into a new outfit. That said, bath time should also be fun and relaxing. If your baby shrieks and cries with every bath, don’t force it every night. Instead, focus first on making bath time a positive experience before adding it to your routine. Baby massage: Whether you bathe your baby or not, a massage can signal the winding down of the day. Not only is this a special treat for your baby, the massage itself will also relax his mind and body, making it a conducive activity right before sleep. Pajamas: Dress your baby in special pajamas he only wears in the evenings. For instance, you can dress him in a zipped one-piece suit on top of his usual onesie. Tip: Go with zipper pajamas and not buttoned ones—buttons aren’t convenient in the middle of the night! Swaddle: Many babies benefit from wearing a swaddle during sleep. Placing your baby in a swaddle will feel comforting and remind him of the time he spent in your womb. Special conversations: A wonderful way to cap the day is to spend time talking with your baby. You can start a tradition of what you liked best and least about your day, or what you look forward to tomorrow. Songs: One of our nighttime routines was singing Twinkle, Twinkle Little Star and The Itsy Bitsy Spider before laying my kids down in bed. It became a tradition all through their toddler years, too! Books: I’m a fan of reading books to kids, especially in the evenings. It becomes a fantastic time for you to snuggle and share a special moment, all while building a habit of reading. Check out my list of bedtime books for recommendations! Music: Use this time to play lullabies as he gets ready for sleep. Say “good night”: One of my favorite nighttime activities was carrying my baby around the room and saying good night to certain fixtures. I borrowed this idea from the book, Goodnight Moon, another of our favorite books. Before turning off the lights, we’d say good night to pictures, lamps, and special toys before laying him down. Dark room: A dark room is helpful for your baby to sleep in long stretches. Install darkening curtains to block lingering evening light as well as the early sun the next morning. White noise: Babies love white noise, especially since it reminds them of being in your womb. Not only that, white noise muffles startling noises in the room or out in your home, making for longer stretches of sleep. Nurse or feed: During the day, I’d feed my baby after he woke up, not before. One exception was during our nighttime routine. This was the only time I’d feed him before sleep as a way to signal bedtime and fill him up for a few hours. Every baby will have a different nighttime routine, and even this routine will evolve as he grows. And while off days will happen, the most important factor in an effective routine is its consistency. Be as consistent so that if the time comes for you to change plans, your baby will be more willing to oblige. Having grown so used to a consistent routine, he’ll see off days as exciting changes to routine, rather than overwhelming disruptions. Even now, my kids at seven- and three-years-old still have a routine that has evolved over time. We’ve replaced feedings with tucking in blankets, though we still read four books as we did when they were babies. I credit routines for accommodating changes or special occasions thrown our way. Routines have given my kids a consistent ending to their days, one they’ve come to rely on and expect, for a good night’s sleep. Tell me in the comments: What are you struggling with in the evenings? What baby nighttime routine would you like to implement? Great post! I think that a key point in all of this is that babies NEED sleep to develop and parents need it to recover from each day. Thanks for sharing! Thanks, Michelle! Yes, sleep is so crucial for the whole family.